Isotyping is a key part of mAb development, and is traditionally carried out using time-consuming and labor-intensive ELISA assays. ACROBiosystems’ Five-Minute Isotyping kits employ a revolutionary lateral flow assay to determine the class and subclass of your mouse or rat monoclonal antibodies. With the help of this product, you can now obtain your results within five minutes. The Five-Minute MAb Isotyping Kit provides a lateral flow assay for monoclonal antibody class and subclass, and light chain type determination. When a sample is loaded onto the cassette, the antibodies will form soluble complexes with pre-embedded gold conjugates. These complexes are resolved and captured by class or isotype specific antibodies impregnated at different areas of the membrane. As a result, a red line will appear at the corresponding region with isotype indicated. ELISA based isotyping methods are technically demanding and time consuming. It often takes hours to prepare the reagents, set up the reactions, and analyze the data. On the contrary, our isotyping kit can deliver clear results in just five minutes, and the only thing you need to do is adding a drop of sample onto the cassette. The use of this product would greatly increase the efficiency of your research. Serial dilutions of a mouse mAb were loaded onto the isotyping cards to allow determination of its isotype. The images were taken five minutes afterward. 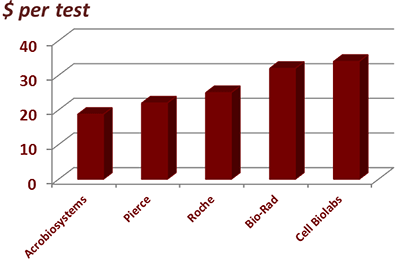 ACROBiosystems' Five-Minute Isotyping Kits are highly affordable. The cost is as low as $18 per test for mouse mAb isotyping, which is much lower than any other commercially available comparable products. We offer two different mouse mAb isotyping kits for you to choose. 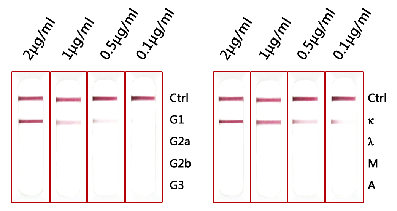 The complete 8-plex mouse mAb isotyping kits allows you to test all common isotypes including IgG1, IgG2a, IgG2b, IgG3, IgA, and IgM, along with light chain Kappa and Lambda, while the more cost-effective 6-plex mouse mAb kits are designed for customers who don't need to assay for IgG3 and IgA.